If you're scouting for a casual yet seriously chic outfit, consider pairing a Boohoo Erica Waterfall Suedette Jacket from BooHoo with black leather skinny pants. Both of these pieces are super comfortable and will look great together. Rocking a pair of black leather pumps is a simple way to add some flair to your look. If you're all about relaxed dressing when it comes to fashion, you'll love this seriously chic pairing of a beige duster coat and light blue ripped denim shorts. White leather low top sneakers are a nice choice to round off the look. If you're obsessed with relaxed dressing when it comes to fashion, you'll love this extra adorable pairing of a Boohoo beige duster coat and black leather leggings. Go for a pair of brown leopard suede ankle boots to kick things up to the next level. If you're all about relaxed dressing when it comes to fashion, you'll love this seriously chic combination of a Boohoo beige duster coat and black leather leggings. Got bored with this getup? Enter black suede over the knee boots to jazz things up. 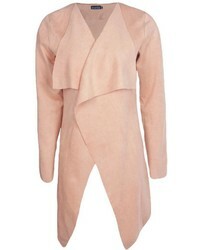 If you're hunting for a casual yet incredibly chic getup, try pairing a beige duster coat with a tan button skirt. These two garments are totally comfortable and will look stunning when paired together. Bump up the cool of your getup by wearing white suede heeled sandals. If you're hunting for a casual yet seriously stylish getup, reach for a Boohoo Erica Waterfall Suedette Jacket from BooHoo and a light blue print pencil skirt. As well as super comfy, these two pieces look great when paired together. For something more on the daring side to complete this ensemble, go for a pair of white plimsolls. If you're looking for a casual yet absolutely chic look, consider teaming a Boohoo Erica Waterfall Suedette Jacket with white flare pants. As well as very comfy, these pieces look incredible paired together. Wearing a pair of beige leather heeled sandals is an easy way to add extra flair to your outfit. If you're in search of a casual yet stylish ensemble, go for a Boohoo Erica Waterfall Suedette Jacket and navy floral skinny pants. As well as super comfy, both pieces look great when paired together. To add oomph to your ensemble, round off with black leather heeled sandals. 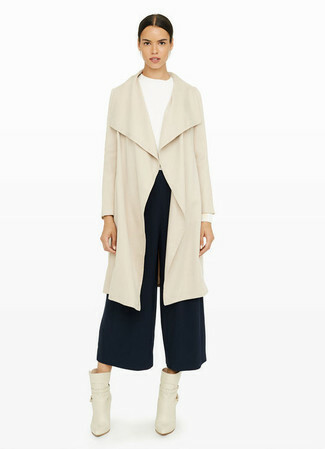 If you're scouting for a casual yet incredibly stylish ensemble, reach for a Boohoo beige duster coat and navy culottes. These pieces are super comfy and will look great when paired together. Bring a touch of sophistication to your look with beige leather ankle boots.